Yesterday I decided to cut my bangs, now I have a short bangs with bob hair style. I think i like my short hair like this so if my hair will grow long I'm going to cut it again. The reason why short hair looks nice is, it looks simple, but, sometimes it's wrong, I often spend 30 minutes to styling my hair, because it's always looks a mess every time I wake up. That's why women tend to be a hassle, we care bout everything when everyone doesn't care about it. 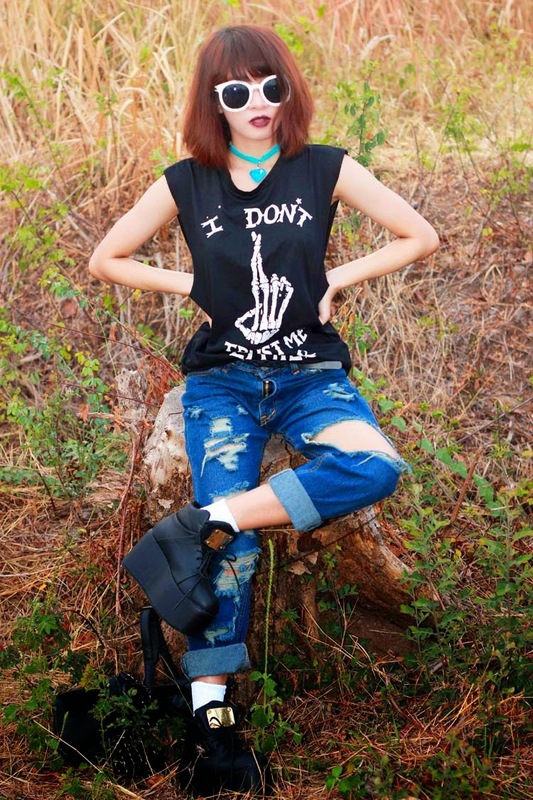 Yesterday I found a place to take a shoot so here we go, maybe I look a little bit different, but I love being edgy so much, and, wearing high platform is everything. I love short hair! I personally find it easier to maintain and don't even need to brush my hair anymore. And dang, I admire the thick platform of your shoes! Whoa, I'm in love with you, and your ouftit!That shoes are dope! wooooott, this is totally awesome! I love your outfit Rin! So 90's cool! Really cool outfit! I adore your sunglasses! Fabulous hair style and sunglasses! your bangs totally change your whole look. I love your denim outfits! those platform shoes are awesome! Love your graphic tee and those amazing shoes! So gorgeous! 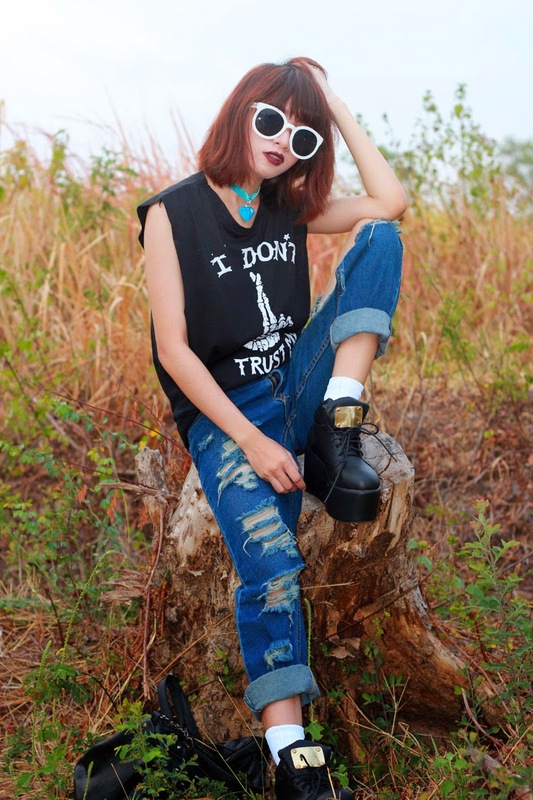 Love your grungy edgy look! Now on aboyeurblog.com : My Monday Shopping Edit! Stop everything you are doing and start shopping some freaking hot high knee boots! Love this outfit - you are so cool!! Please check out my blog if you have the chance, you are a huge inspiration to me! You rock that outfit girl! I love it! So edgy and cool! wow this look is so edgy and stylish! Great pictures and amazing shoes! Those ripped jeans are amazing ! you look fabulous! really awesome! can we follow eachother for keep in touch? Love the ripped denim. It gives your look such a casual and cool vibe! Aweeee, so stunning and cool! Very nice! I really love this look! The jeans and boots are brill!